Eastern purple bladderwort, photographed at J.W. Corbett Wildlife Management Area, West Palm Beach, Palm Beach County, in March 2016. Fear the eastern purple bladderwort, Utricularia purpurea. It's coming to get you. Not really, of course. The eastern is, in fact, a carnivorous plant, but like other carnivorous plants found in Florida, its prey is tiny, microscopic critters floating around in the water. And there's some question about how carnivorous it might actually be. 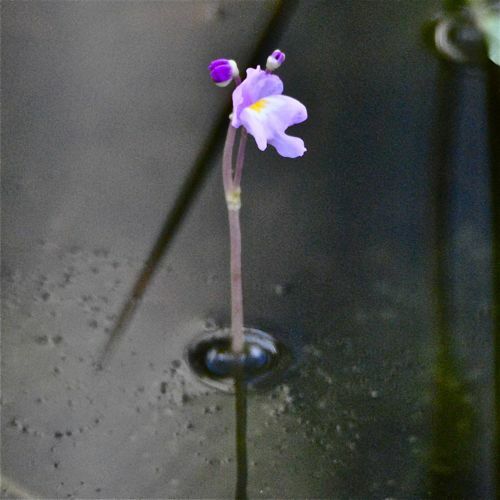 The basics: the eastern purple bladderwort is a Florida native found throughout most of eastern and central North America, southward through the Caribbean, Mexico and Central America. Its range includes most Florida counties, but it is considered rare in South Florida. It's a rootless, floating aquatic plant, most of which is submerged. A short stem topped with a small violet flower with an orange and deep purple throat rises above the water. The plant blooms year round. What appears to be roots are actually whorls of leaves to which tiny bladders are attached. These bladders are the killer parts. Each bladder has a door that opens inward when triggered, sucking in water and whatever it's carrying — including microscopic animals. Once in the bladder, they are unable to leave, so they die and decompose into a puddle of nutrients. This mechanism allows eastern purple bladderwort and its relatives to make a living in nutrient-poor places. Or so it's commonly assumed. 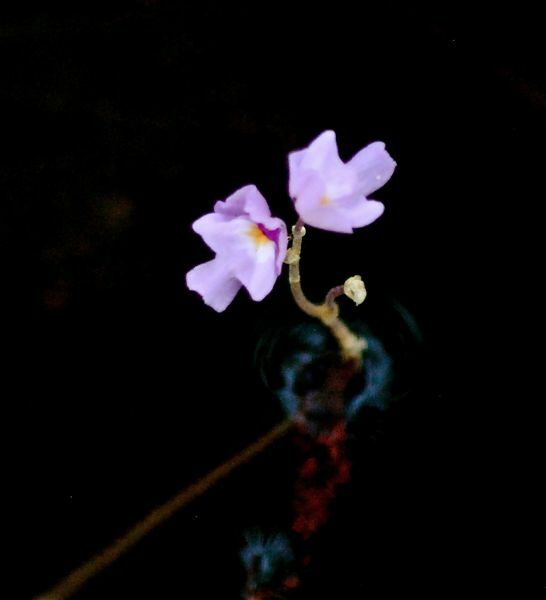 According to a study done on eastern puple bladderwort plants taken from the Everglades, the bladders collectively made up between a quarter and half of the plant's mass. But the amount of dead critters in them was disproportionately small. On the other hand, they did have populations of small animals and plants living inside them. The study, written by Jennifer H. Richards and published in the January 2001 edition of the American Journal of Botany, found that the amount of nutrients the plants gained from carnivorism was minimal especially considering the large "investment" in bladders they make. Instead, Richards proposed that the bladders might be providing a micro habitat for these tiny plants and animals, which in turn were providing the host with nutrients through the normal cycles of life and death. Carnivorism would be more incidental rather than intentional. By the way, members of the genus Utricularia make up 42 percent of all carnivorous plants in the world. Utricularia also has the widest geographic distribution of any genus of carnivourous plants. 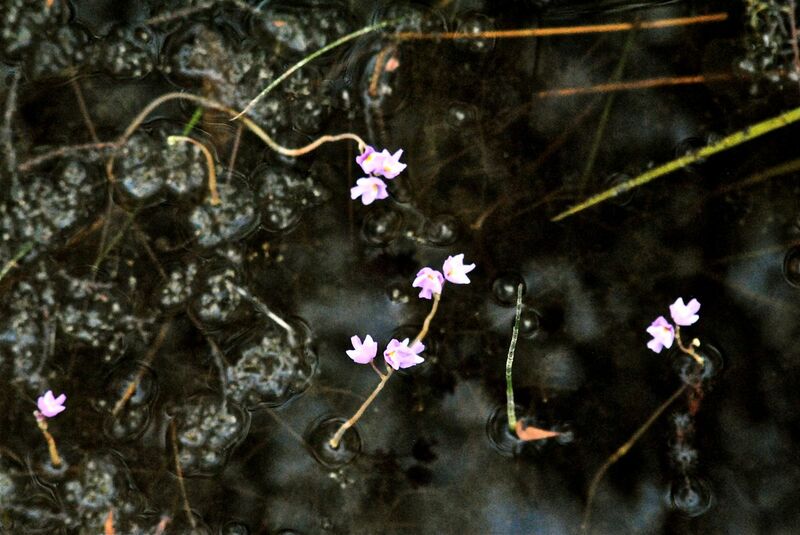 Eastern purple bladderwort is considered "rare" in Indiana and Pennsylvania, where it's simply called purple bladderwort, and is legally classified as threatened in Maryland. It is a member of Lentibulariaceae, the bladderwort family of carnivorous plants.